If you’re exploring the idea of adding berries and bramble fruits to your farm, this course will help you consider all the aspects of this decision, from varieties and site selection all the way through profit potential and marketing. This course will be especially useful if you are exploring the possibilities of growing berries for income – be it supplemental or for your livelihood. The material presented will assume little past knowledge of farming, but a background in gardening will be very helpful. The bulk of the course happens on your own time, with discussions, readings, and assignments in MOODLE, our virtual classroom. To add to the experience, webinars will be woven into the online interface of the course to allow you to meet on a weekly basis to learn from outside presenters and ask questions to address your farm issues in real time. If you miss a webinar, they are always recorded and posted for later viewing. Amy Ivy is a regional vegetable specialist for the Eastern New York Commercial Horticulture Program of Cornell Cooperative Extension (CCE). Jim O’Connell is the small fruits educator for Cornell Cooperative Extension in Ulster County, NY. Tues Nov 6 – Dec 11, 2018 with webinars every Tuesday evening from 7-8:30pm Eastern time. Webinars are always recorded for later viewing. Registration is closed. This course will next be offered in Fall 2019. Week 2: Site Selection – Understand how to evaluate the quality of your soil using several different physical and chemical tests. Learn to evaluate the market potential of a site. Learn how to identify suitable irrigation sources. Week 3: Blueberries – cultural systems of blueberries; recommended varieties; pest management. Week 4: Strawberries – cultural systems of strawberries; recommended varieties; pest management. Week 5: Bramble Production: Raspberries and Blackberries – cultural systems of bramble crops; recommended varieties; pest management. 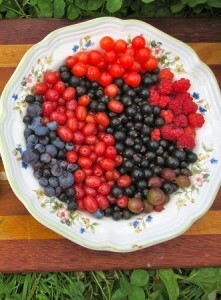 Week 6: Lesser known berry crops – many minor berry crops will be covered (currants, gooseberries, and others). Registration for this course is closed. It will next be offered in Fall 2019. Fee for this course is $195-295, based on household income. Sign up a month or more in advance of the next course start date and receive $25 off. Sign up for three or more courses and received $50 off your total.